Hooray! A little update on the house repairs! I've been able to fix a few holes in the walls and even gave a little render a go. Today's effort was patching up a very bad spot. 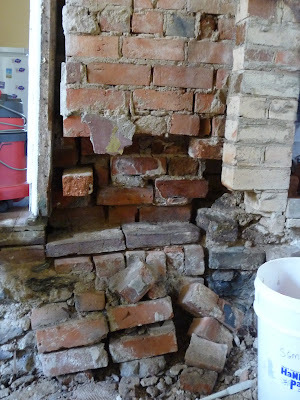 The wall literally moves when pressed and when I cleaned the area, bricks pretty much fell out! I took them out carefully and vacuumed out the mess. The whole thing made me feel quite nervous! So, you can see how relieved I was when I finally finished, and it looks pretty good. There was a smaller "hole" on the other side of the fireplace that we'd repaired earlier in the week. It's starting to look a little like a loungeroom! Plenty more work to be done yet, I know, but the cold is being kept out a bit more, and we're a few steps closer to getting a floor in. I'll keep you updated! Well done. You will have a roaring fire quicker than you think. You amaze me with all that you can do. I am looking forward to when the lounge room is done. Good to hear you blogging again. I love hearing about the progress of your cottage rejuvenation! Read your blog from start to finish last night. You are doing and have done a great job. I look forward to see what the future brings for you both. Good luck. It is so refreshing to see young people doing something so rewarding.